I don’t think I have to tell most of you it’s been cold. Even here in Virginia we’ve been suffering with it the past few weeks. For me, nothing fits the bill for the winter better than some good knitting to work on. 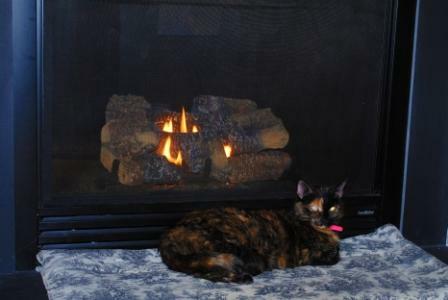 So,with the help of some luscious Juniper Moon Farm yarn I cast on the Madelinetosh Honey Cowl and worked on it while Sushi enjoyed the fireplace. 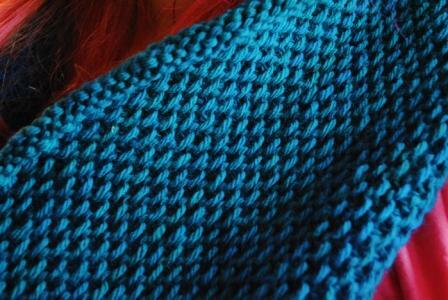 If you’ll recall, my first attempt at the cowl ended in frogging because I had a twist in it. I re-cast it super carefully and ended up with about 300 twists, so I gave up and knitted the darn thing the whole way, twists and all. It worked out okay; I had to do some creative “steeking” (a scary procedure whereby you sew a seem and then cut your project and re-sew or pick up new stitches) I managed to straighten it right out. I really love how it came out otherwise. The color is just ridiculous gorgeous (thanks to the always fabulous Suzy Q who dyed it for Susie last fall) and super soft and scrunchy. Can I tell you how hard it is to be friends with someone who sells yarn???? I have to talk myself out of stealing some every time I am over there. The good news is I have plenty of yarn and projects already lined up and waiting for me to just get to them. Some day in 100 years when I have free time. 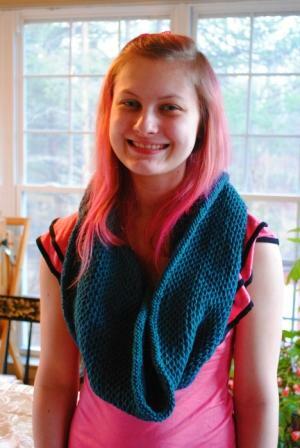 This entry was posted in Uncategorized and tagged Knitting, Pets. Bookmark the permalink. ← Holy Cow! A Painting! Free time?? hey, I’ve figured out a secret to gain knitting time-especially for easy patterns- I’ve been keeping a plain project in the bathroom! It may hint to the level of obsession I’m entering with regards to knitting, but if I sneak a phone in with me, I’m guaranteed an inch a visit! !